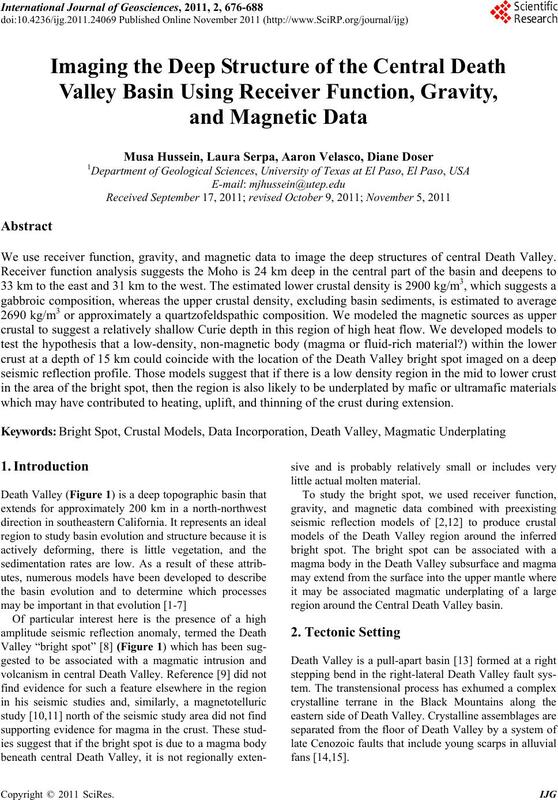 We use receiver function, gravity, and magnetic data to image the deep structures of central Death Valley. which may have contributed to heating, uplift, and thinning of the crust during extension. region around the Central Death Valley basin. along the Black Mountains to the east of the basin [2,15,16]. is domed upward beneath the basin . ments of crustal thickness under a broadband station. horizontal components to radial and transverse directions. volution method, keeping data with an 80% or greater fit. 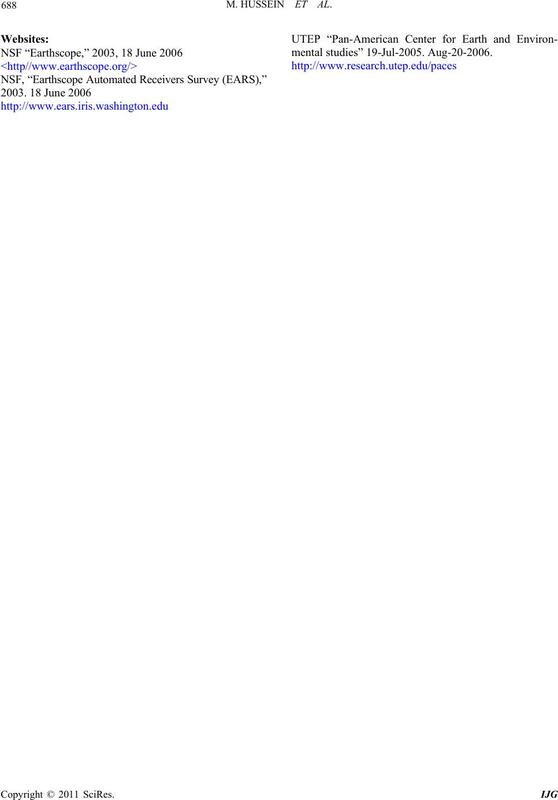 functions using the approach of . Table 1. 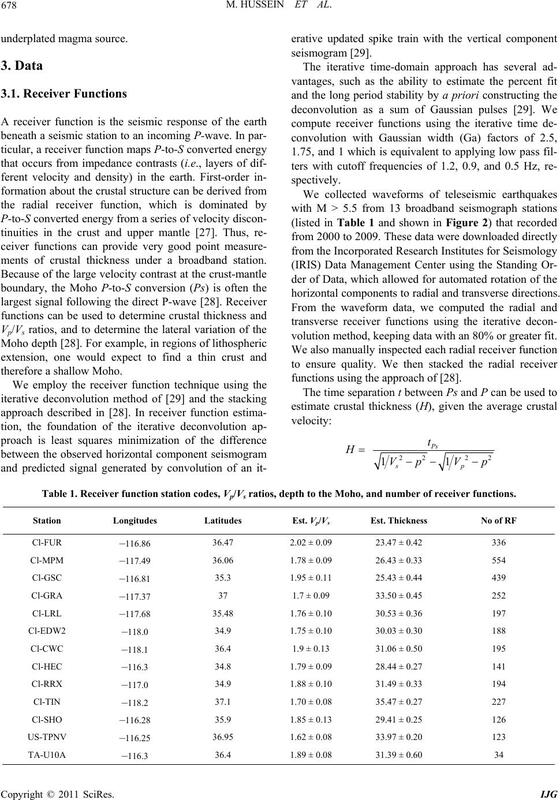 Receiver function station codes, Vp/Vs ratios, depth to the M oho, and number of receiver func tions. shown inside small squares beside eac h station. in the crustal thickness . and (H) can be estimated [30-32]. ing to stations GSC, CWC, FUR, and MPM, respectively. See Figure 2 for station locations. the shallowest Moho at less than 24 km depth in the area. where the stations are located. gioclase-rich mafic composition of the lower crust . there is magma in the crust. were merged from a variety of surveys and cover the U.S.
proach of [3 6] . Fault zone; GFZ, Garlock Fault Zone. covered wit total of (7930) gravity measurements. interpretations [2,8,12,18] and the receiver function data. exposed in the Black Mountains. high density mantle m aterials clos er to t he s urface lo cally. 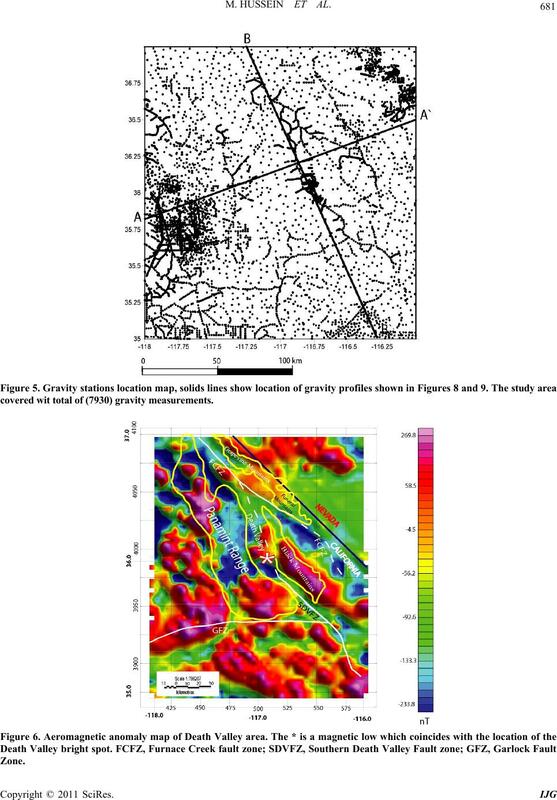 seismic data interpretation of  for line L9 (Figure 1). 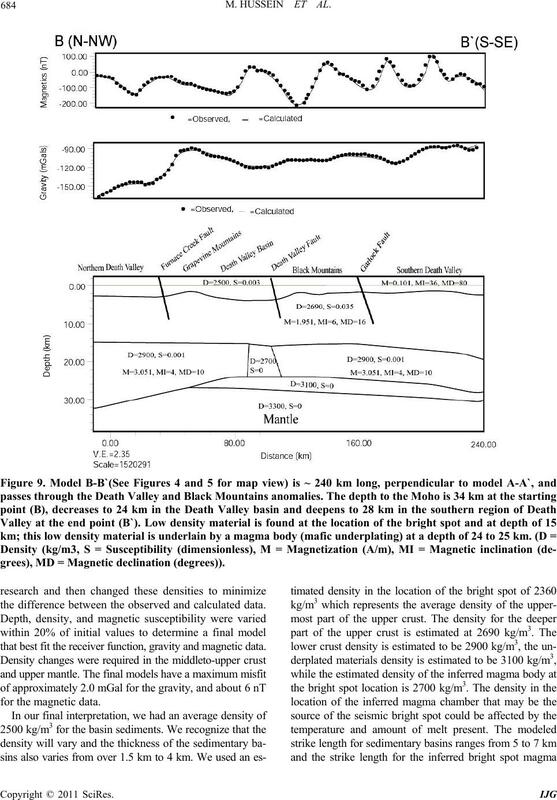 COCORP line 9-L9 (Figure 1), with density (D) and magnetic susceptibility (S) model in central and southern Death Valley. to explore the model possibilities further. as observed data to the 2.5-D forward modeling program. tion of the receiver function data, discussed previously. rived from the receiver functions. grees), MD = Magnetic declination (degrees)). the difference between the observed and calculated data. that best fit t he receiver f unction, gravity and magnetic data. chamber is 5 km and is symmetrical about the profile. crust and upper mantle . in the Black Mountains and Funeral Mountain areas. and mapping of faults . by both the shallow basin sediment and deep structures. gives rise to the bright spot of Death Valley. region are consistent with the interpretation of magma. additional geophysical data are needed. Cornell and Dr. Vladik Kreinovich for helpful discussion. partially supported by NSF grant number HRD-0734825. cal Journal, Vol. 89, No. 1, 1987, pp. 55-60. Terrain,” Geological Society of America Bulletin, Vol. 101, No. 11, 1989, pp. 876-885. 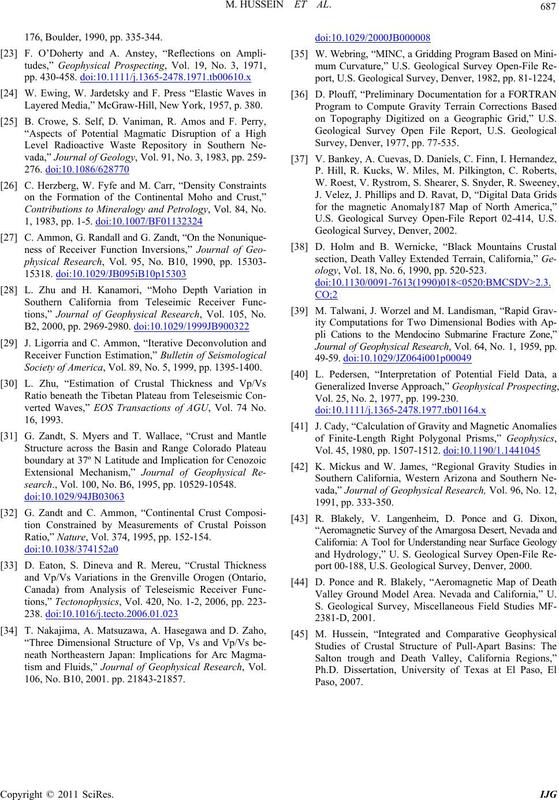 South-Eastern California,” Tectonics, Vol. 15, 1996, pp. 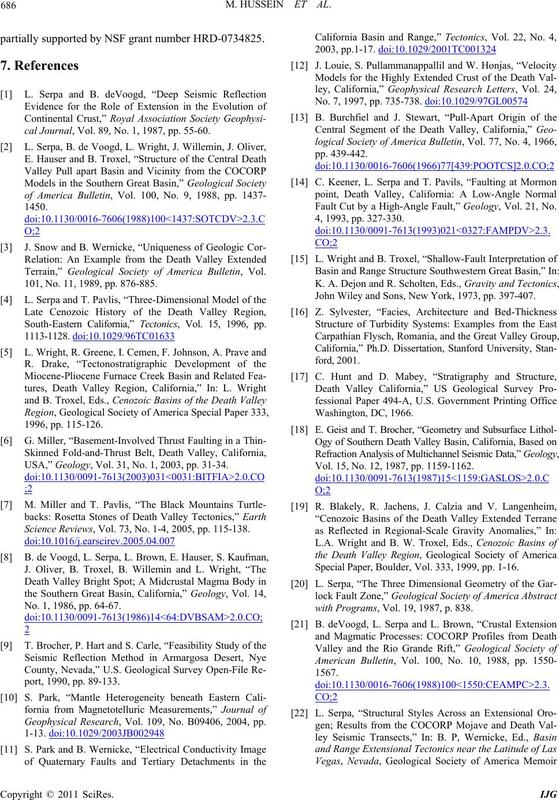 USA,” Geology, Vol. 31, No. 1, 2003, pp. 31-34. Science Reviews, Vol. 73, No. 1-4, 2005, pp. 115-138. No. 1, 1986, pp. 64-67. 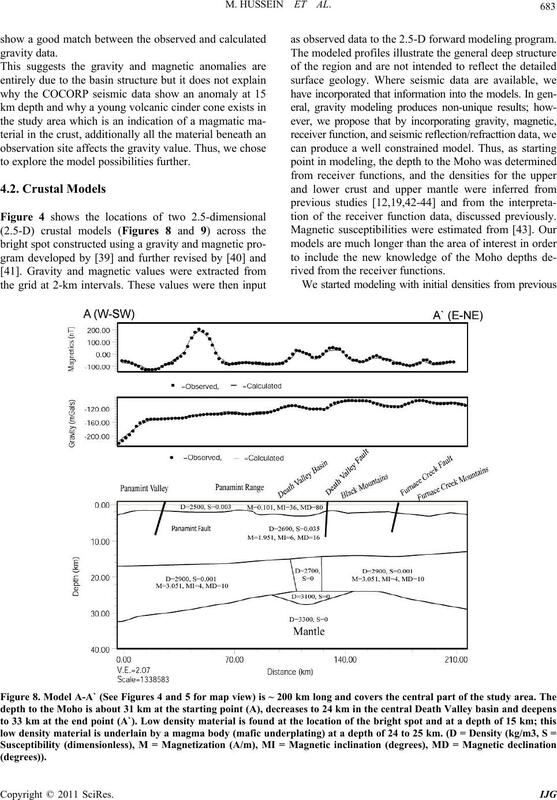 Geophysical Research, Vol. 109, No. B09406, 2004, pp. Fault Cut by a High-Angle Fault,” Geology, Vol. 21, No. John Wiley and Sons, New York, 1973, pp. 397-407.
fo r d , 2001. Vol. 15, No. 12, 1987, pp. 1159-1162. Special Paper, Boulder, Vol. 333, 1999, pp. 1-16.
with Programs, Vol. 19, 1987, p. 838. 176, Boulder, 1990, pp. 335-344. Layered Media,” McGraw-Hill, New York, 1957, p. 380. Contributions to Mineralogy and Petrology, Vol. 84, No. 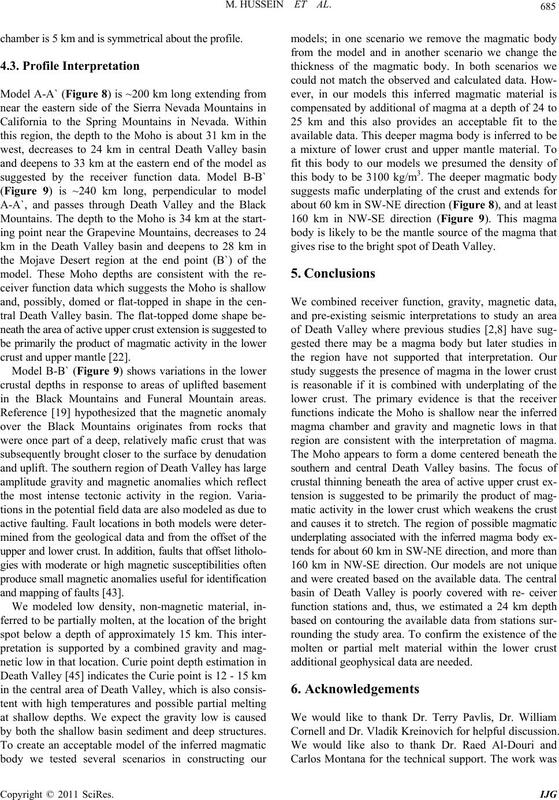 tions,” Journal of Geophysical Research, Vol. 105, No. Society of America, Vol. 89, No. 5, 1999, pp. 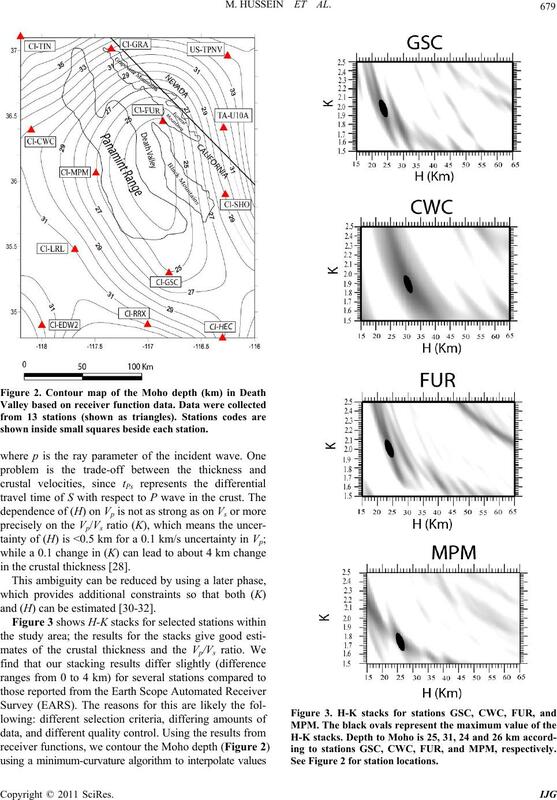 1395-1400.
verted Waves,” EOS Transactions of AGU, Vol. 74 No. search., Vol. 100, No. B6, 1995, pp. 10529-10548. Ratio,” Nature, Vol. 374, 1995, pp. 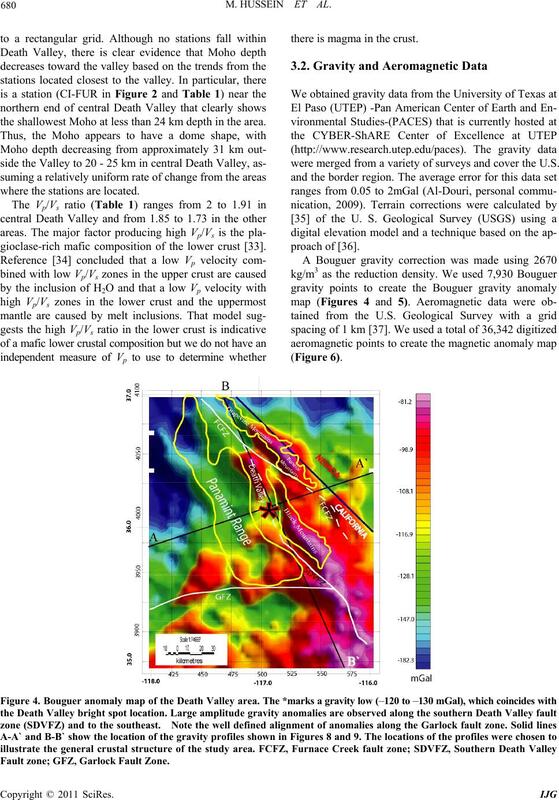 152-154.
tism and Fluids,” Journal of Geophysical Research, Vol. 106, No. B10, 2001. pp. 21843-21857.
on Topography Digitized on a Geographic Grid,” U.S.
Survey, Denver, 1977, pp. 77-535. 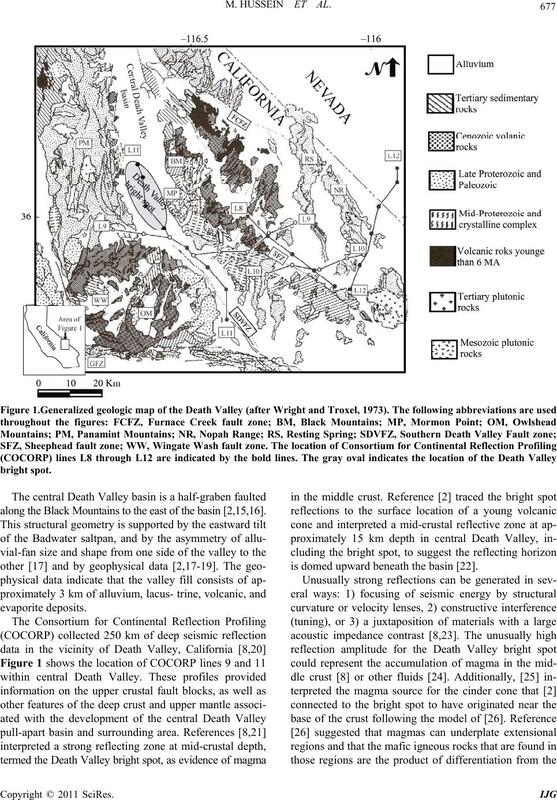 U.S. Geological Survey Open-File Report 02-414, U.S.
ology, Vol. 18, No. 6, 1990, pp. 520-523. 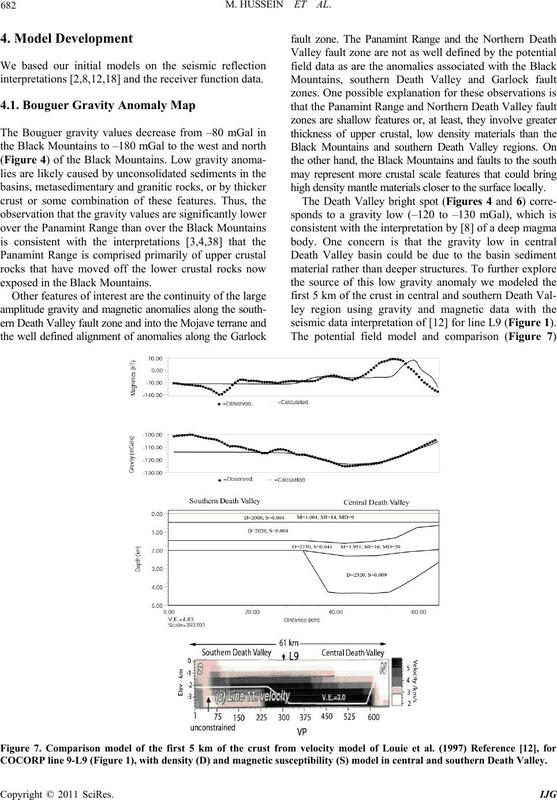 Journal of Geophysical Research, Vol. 64, No. 1 , 1959, pp. Vol. 25, No. 2, 1977, pp. 199-230.
port 00-188, U.S. Geological Survey, Denver, 2000. Valley Ground Model Area. Nevada and California,” U.